My little girl has a birthday this week and I wanted to make sure she (we) had some 'Thank You' cards on hand for any gifts. Thanks so much to BudgetGadgets for being our sponsor this week. Abby has all of the info over at her blog, if you get a chance go visit them of FaceBook (click here to visit them). If you're looking for the Flaunt It Friday's Happy Hauntings Blog Hop Click here or scroll down. Welcome to day two of this yummy hop!!!! For today's treat we made . . . Mix all the ingredients together. Roll the dough into small balls, place on a cookie sheet and bake at 350 for 8-10 minutes. Let cool. These are really easy to make with little helpers, and they'll LOVE THEM!!!!! Remember to leave a comment for a chance to win my yummy blog candy! Your next stop is Tracy at Craft Junkie Too. As always, Thanks for stopping by!!!!!!!! Well, the hop was supposed to start on the 13th, but due to technical difficulties we started a day late (sorry about that). I feel so honored to be a part of this hop!!!! :) I hope that you came after visiting Carri at Double Click Connections aka A Busy Bee. Isn't she AMAZING!!!!! I love her work (this time it was especially yummy looking)!! 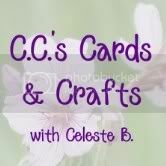 :) If you just happened to stop here first, make sure to start at the beginning with Georgiana at Carson's Cricut Creations. All of the ladies have some amazing goodies to share!!! For today's project, I wanted to show you a favorite of mine. :) Cookies in a jar!!!!!! In a large bowl combine 3/4 cup of butter, 1-2 eggs (this depends on where you live and how dry your climate is), and 1 teaspoon vanilla. Beat until creamy. Add in the contents of the jar. Drop by tablespoonful onto an un-greased cookie sheet. Bake at 350 degrees for 8 to 10 minutes. Ok, now to candy for YOU! I can't seem to get a good picture of it, but I have some kitchen wall decor to give to one lucky person. 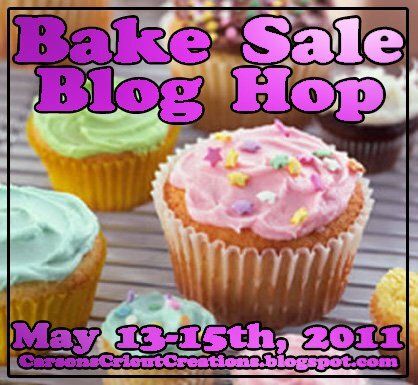 :) All you need to do is leave a comment with your favorite Bake Sale goodie!!! :) That's it!!!! So, welcome!!!!!!!!! I hope you are stopping by after visiting Monica at Simply Cricutting, if not start at the beginning at Flaunt it Fridays!! This week at Flaunt it Fridays we are challenging everyone to use the Happy Hauntings cartridge. Unfortunately I do not own that cart (although, I think I really want it); so instead I used October 31st cartridge. For my second project (using any cut from the cartridge) I decided to do a scrapbook page. For those that know anything about me, you know that I am TERRIBLE at scrapbooking. My philosophy is plain and simple. I did cut out a headstone from the Wrap it Up cartridge at 2. Again, it's not the fanciest thing, but it a big challenge for me. Now if you get lost along the way, the line-up is below. Remember - we'd love to see what you make!!!! Join us in the fun and make sure you link your project over to Flaunt it Fridays!!! Thanks for stopping by!! Make sure you say 'hi' to Carley for me!!! It's been a while, but I'm so happy to post for Flaunt it Fridays!!! This week the challenge is to use the castle on the Wrap it Up cartridge. I'm so excited!!! I just got this cartridge on Wednesday (a two month late anniversary gift from the hubby)!! So, here's my first creation with this cart! Since Mother's Day is just around the corner, I wanted to make a card for my Mother-in-law. Making something for family means (of course) that I have 'little helpers' that are involved. Both of my little ones helped pick colors and put it together. :) The castle was cut at 4'.